In yet another sign of the impending apocalypse, Neil Young will receive a Grammy Award. Finally. Over the years, Neil has been nominated for at least 13 Grammys but has never made it to the podium. Neil Young will be honored as the 2010 MusiCares Person of the Year for "his exceptional and influential artistic accomplishments as well as his philanthropic work, which has included many generous charitable activities over the years." A dinner and concert honoring Young will be held in Los Angeles on Jan. 29, 2010, two days before the 52nd Annual Grammy Awards. Proceeds from the event will provide support for MusiCares, which ensures that music people have a place to turn to in times of financial, medical and personal need. "It is an honor to celebrate the extraordinary legacy of Neil Young at our 20th Annual MusiCares Person of the Year tribute. Neil has set a standard of artistic integrity and iconoclastic creativity for more than four decades, and his achievements have been matched by his unwavering humanitarianism. He is a shining example of how music people offer their creative gifts to the world, and how they also give back through their commitments to charitable endeavors. Throughout his career, Neil has stood out as an exceptionally talented performer, and he has stood for causes that are both noble and close to his heart. We look forward to paying tribute to him at this signature Grammy Week gala." While not an award based strictly on a music release, the Musicares Award strikes us as a recognition by his peers that is far above and beyond the Academy's "traditional" awards. And it seemed like almost every year we've run some variation on the story of a nomination and the result. 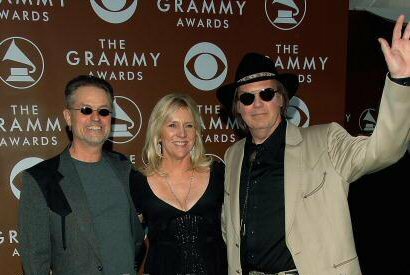 2005 - 2 Grammy Nominations Rock Album of the Year for "Prairie Wind", and the other for Rock Solo Performance for song "The Painter"
Congratulations Neil & Pegi! Well deserved. Neil's generosity to his fellow musicians' causes has been tremendous. Back in 1994, we compiled a listing of benefit concerts that Neil Young has performed. It's quite impressive and has certainly grown substantially since. Thanks for the links neilyoung.org for reconnecting thoughts and actions. UPDATE 8/11: There's been some discussion as to whether this is actually a Grammy Award. Can't say for sure other than it's an award handed out by the Academy. UPDATE 8/13: Headline and article modified. All I can say is... Its Long OVERDUE. Congratulations Neil enjoy it. There should have been one for "Dead Man"!! Neil has been my Rock n Roll hero since I heard him with Buffalo Springfield years go. Hey, if there was a grammy award for "longest surviving Legend" he would have a monopoly on that wouldn't he! you are definitely not "An unknown legend"
You'll be able to shove that in the Archives 4 hey! Look if ya learn how to play the sax..you could go for President! A dinner and concert honoring Young will be held in Los Angeles on Jan. 29, 2010, two days before the 52nd Annual Grammy Awards. Good thing. Not sure if he'd show up for the award show. While it's not a Grammy for music performance (you have to understand that the awards are pretty politically oriented and Neil's never tried nor wanted to be an insider in that world), I think it's even more special that Neil's being honored by MusiCares. Pretty much anyone can make music, but not everyone goes out of their way to help their fellow men. Congratulations to Neil and Peggy for this... the honor is very much deserved. Who cares about emmies, oscars, grammies or what ever: the music should be what is important. So: Neil you get a Grammy: forget it! ..And do ya think he REALLY gives a rats! Good on Neil. Well deserved! Congratulation. To you Neil Young a man like no other, a real visionary his heart speaks through his music. He is the man with a heart of gold.